Library This window comprises 6 areas, any one of which can be made fully visible by clicking on its name: Songs, Bibles, Presentations, Images, Media or Custom slides. Service manager This shows the current service plan, both when it is being created and when it is in use during the service. Preview This shows the next item to be displayed on the screen during a service. It can also be used to preview any item from the library, and the item in the preview panel can be sent to the live panel. Live This window shows what is currently being shown on the screen. Both the preview and live panels have an upper and lower section. 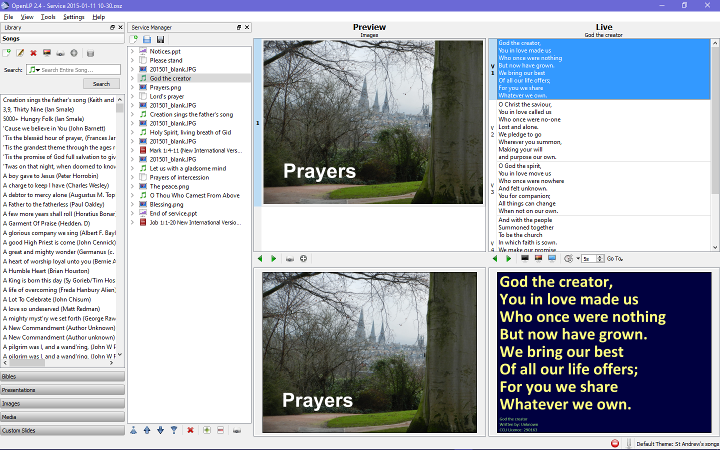 The lower section shows what is currently (or for the preview, about to be) projected on the screen and the upper section shows any additional material in this item - for example the other verses of a song or the other slides of a presentation. Theme manager You will not normally need to use the theme manager. A theme comprises a selected font, the font colour and size and the background colour or image. Several themes have been designed for St Andrew’s purposes. Please use these themes where possible and do not edit them without careful consideration. Projector manager This window is not relevant at St Andrew’s and should be kept hidden. Each of these windows may be shown or hidden using the View menu. The windows can be arranged and sized in any way you choose, but for our purposes a good layout has them displayed in the following order, left to right: Library, Service manager, Preview panel, Live panel as shown above. The Theme manager and Projector manager should be hidden.